Memory #4978373-Dad and I drive to SLO to look for a place! This is my first installment of what I hope to be many that will document the many memories I have in the depths of my brain, and emotions that I want to get down in writing. The numbers associated with these memories are just random numbers really, but it’s fun to think how many memories we all can actually have! So here we go! My dream college was attending Cal Poly, San Luis Obispo. When I received the acceptance letter I was so excited, nervous and anxious! Months before actually moving, I had to find a place. Dorms were out of the question, as the cost was way to high. So my dad and I made the trip from Fremont to San Luis to take a look at what the city had to offer. It was pretty bad. Place after place, my dad wasn’t satisfied at his only daughter living alone. Looking back neither was I. We looked and looked. The last straw was coming to the back of a home and seeing this “studio.” It was a galley style place that had slanted floors…make-shift really…smelled awful and we were shocked she was asking $800 for it. Give me a break! When we got back in the car, I started to get teary eyed, as we didn’t find anything. We went out to eat and took another look at the paper and this time looked for ads that said room mates needed. The first place we came across was for a Condo room rental on Laguna Lane. We met with the owner, Lori Jackson, and both us were impressed that she was a professor at Poly..not much older than me…or maybe she is younger…either way…pretty cool! Yes, I was on the 10-12 year college plan! For as much as she interviewed us, my dad interviewed her making sure I would be safe and feel comfortable. And the price was right at $400 per month. At least I think it was that low…may have been lower. The ride home was looking better, but we knew she had several applicants…and the further we got away from SLO, towards Fremont, the sadder I became. Then I will never forget what my dad said he would do….He said I could go to the dorms if it meant he had to take a second job. I was overwhelmed with gratitude…really? You don’t need to do that, but he insisted if that’s what it came down to he would do it. When we got home. we told mom everything. As I was telling her about Lori and the great possibility, the phone rang……it was Lori. She asked for my dad and talked to him and offered the place to me!!!!! Over the moon happy! I bet my dad was too! It was set…I have a place to live! I will never forget my dad’s thoughts and words as he tried to make sure his daughter would be safe and happy…. 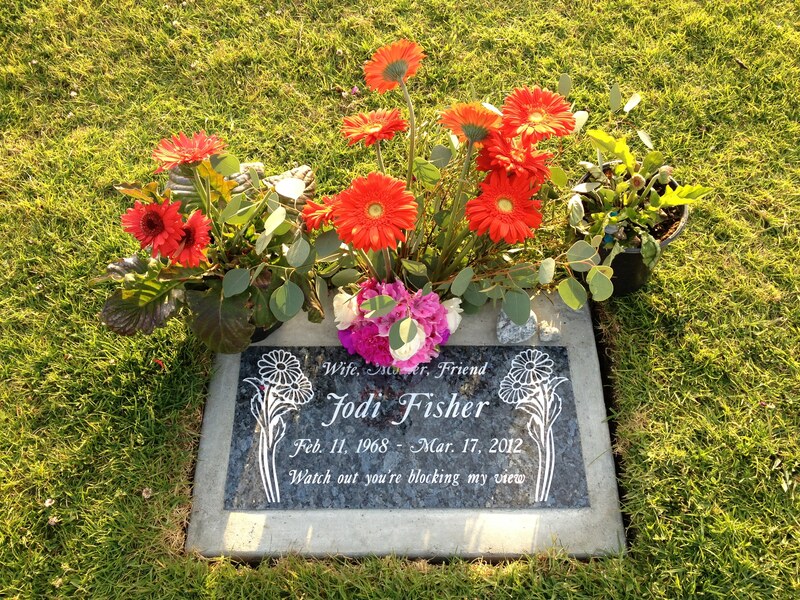 Yesterday marked three months since Jodi passed away. I decided to go visit her site after I worked out. It was a beautiful sunny day and the ocean was roaring in the distance. From her site there is a view to the ocean and beyond, but more than that…it was just simply a peaceful place to be and reflect and talk to her. Yes, I talked to her…alot. I’d much rather she be here in person, bantering with me, sharing new ideas, talking about her family, especially her kids, and just laughing and being together. I cried. I cried for not visiting her in the hospital. I cried for having that wonderful conversation with her at midnight when she was in the hospital…we talked for about three hours. 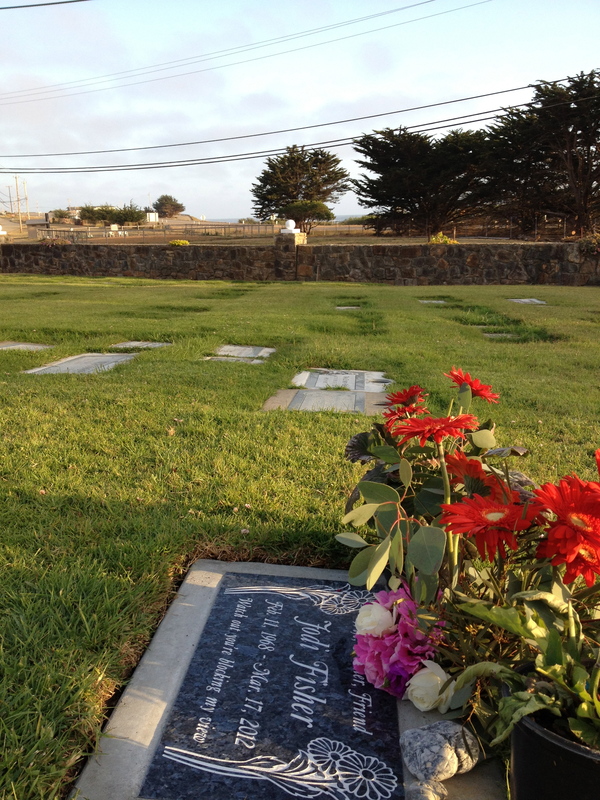 I cried because I thought of her family…I thought of her spirit, and I thought of her ways. 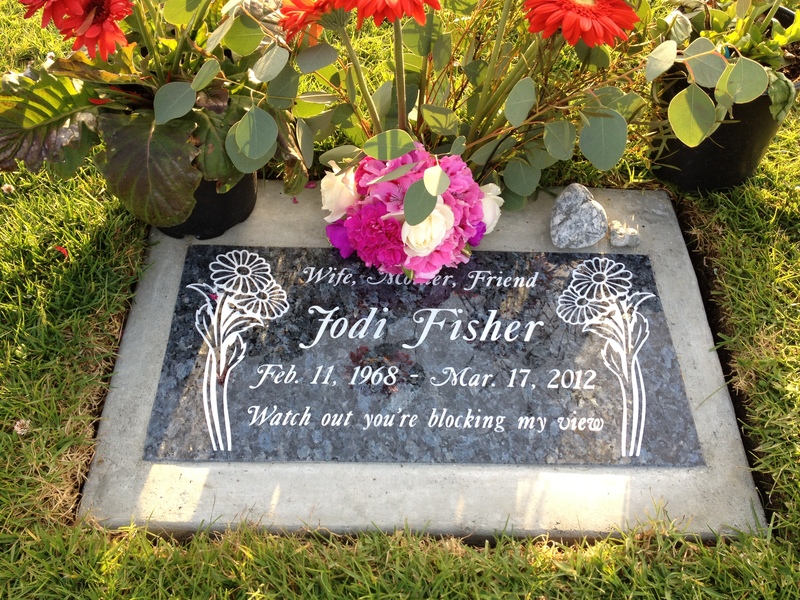 I miss you Jodi girl. I plan on visiting again soon for some more chatting. Love you always.